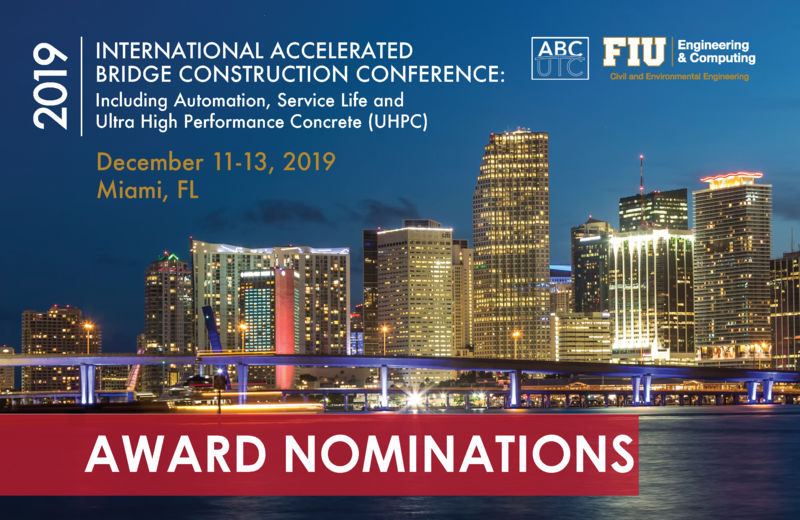 The conference organizing committee is continuing the tradition of recognizing excellence in accelerated bridge construction by seeking nominations for the most influential person and best ABC projects as outlined below. The awards program provides an opportunity to showcase innovative projects and to recognize talented individuals that advance ABC. The need to minimize construction impacts and on-site activities elevates ABC to higher priority starting at the project planning stage. ABC also can be introduced during construction as a contractor initiative or proposal. Benefits of ABC include improvements in safety, and reduction of social costs, and environmental impacts. ABC is a paradigm shift that occurs during the project planning phase where the need to minimize on-site construction activities are elevated to a higher priority. Intrinsic benefits of ABC include improvements in safety, quality, durability, social costs, and environmental impacts. The conference awards program provides an opportunity to showcase innovative projects and to recognize talented individuals that advance ABC. Most Influential Person Contributing to the Development and Implementation of ABC technologies and projects. Eligible bridges must have been constructed or completed and opened to traffic between October 1, 2017 and September 30, 2019. A bridge is defined as a structure, including supports, erected over a depression or an obstruction, such as water, a highway, or a railway, having a track or passageway for carrying traffic or other moving loads, and having an opening measured along the center of the roadway of more than 20 feet between supports. Quality of submitted presentations, though not a criterion, is important. All submissions must meet the detailed requirements outlined below. All entries are due by 11:59 pm EST, September 15, 2019. Submissions received after that date will not be accepted. Entries should be submitted online using the following links. If you are not able to submit your entry or need further clarification, contact Atorod Azizinamini at (305) 348-3821 or via email at aazizina@fiu.edu. The winners will be officially announced at the 2019 National Accelerated Bridge Construction Conference in Miami in December 2019. The official entry form must not exceed ten pages in length when complete. Narrative page type size may be no smaller than 11-point font size and Arial font. All text and graphical displays are not limited to 11 point font but must be legible. Project name and entry category must appear at the top of the page in the header. Entrants may use text, photos, graphics, or charts as needed. Do not modify the official entry form template.